All-natural frozen fries on the grill bring farm fresh flavors to your table. (BPT) - What image does the word “grilling” bring to mind? Do you envision thick, juicy burgers or steaks? What about sauce-slathered chicken breasts sizzling over coals? Cooking out is one of the great joys of warm weather, but if you leave side dishes out of your grilling plans - or stick with cold sides like salads - you’re missing out on some great flavors. Corn on the cob - If you’ve always wanted to try grilling vegetables but weren’t sure which of your favorites would go well on the grill - take heart! Virtually any veggie can be prepared on a grill, but corn becomes a show-stopper when grilled. Remove the husks and silk and toss the cobs right on a preheated grill. Watch them careful and keep turning them to ensure they brown but don’t burn. The heat from the grill causes the natural sugars in the corn to carmelize, and you’ll end up with the sweetest sweet corn you ever tasted! 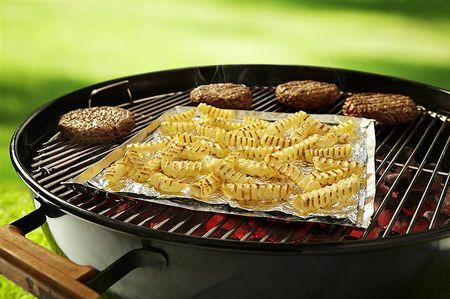 Fries - A trip to the grocery store or farmer’s market for fresh produce may not fit in your schedule if you’re grilling on the fly. There’s good news - frozen options like Alexia Organic Oven Crinkles with Sea Salt deliver farm to flavor taste when prepared on the grill or in the oven. Made from Pacific Northwest russet potatoes, Alexia’s organic fries are sprinkled with bright sea salt to bring out even more of the rich flavor that Mother Nature delivered. Make a tray out of aluminum foil, spread the Oven Crinkles in a single layer, and grill for about 20-25 minutes at 400-450 degrees F. Turn once or twice during the cooking process. Tomatoes - If you’ve only grilled small tomatoes on a kabob, or never tried grilled tomatoes at all, this is your summer to discover grilling tomatoes couldn’t be easier. Start with large, meaty tomatoes - a variety that’s dense and has fewer seeds works best. Slice in half, brush with your favorite seasoned oil and place the halves cut-side down on the grill. Cook for 3-5 minutes on each side. Top with your favorite cheese when done. Kale - Grilling greens like kale helps all those wonderful nutrients and flavor stay in the vegetable and don’t disappear into the cooking water - which is what can happen when you boil veggies on the stovetop. Grilling kale couldn’t be easier. You can adapt virtually any of your favorite kale recipes to grilling by tossing the kale with the recipe seasonings and some oil. Arrange the seasoned leaves in a single layer on the grill and they’ll cook to crispy splendor in just minutes. Cheese - A slice of gooey melted cheese is the crowning glory atop your grilled burger, but cheese can also handle the grill on its own, and be a delicious, different side dish or appetizer. Many cheeses will work on the grill, and you can find recommendations for the best cheeses to cook on the grill with a simple online search. Slice your chosen cheese in thick pieces. Most grilling cheeses will need minimal seasoning and little or no oil. Generally, cheese takes just a minute or two to brown each side and allow the inside to melt. Dinner rolls - Craving dinner rolls to go with that thick juicy steak, but in no mood to fire up the oven when it’s 90 degrees outside? You can make frozen dinner rolls on the grill. Choose your favorite variety, such as Alexia Artisan French Rolls or Artisan Focaccia Rolls, set your gas grill to the temperature recommended on the package’s directions, wrap the rolls in foil and place directly on the grill. Keep an eye on the rolls to ensure they don’t burn as they can cook quickly on a grill.